Ok, ok, I know, this doesn't look anything to do with running but it really is related to it. 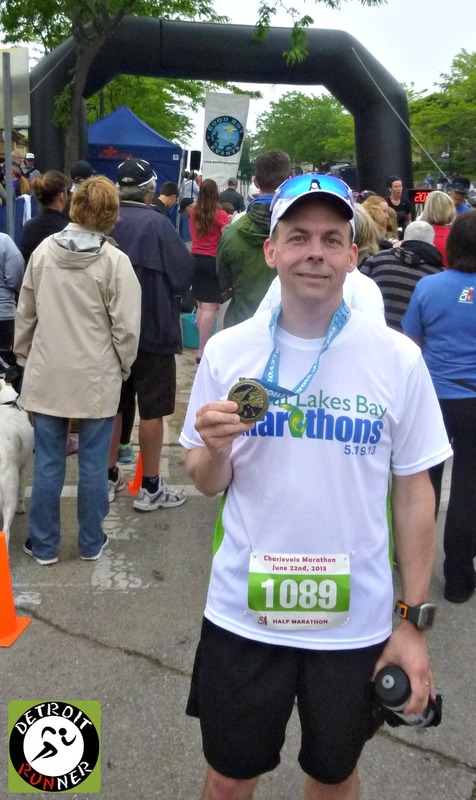 First off, the author, Mark Matthews, who is local to the Detroit area, is an avid runner. Also, this is the story of a young couple who travels to run the San Diego Marathon. In their travels, they end up "meeting" a family living on the streets and the drug smuggling tunnels between the USA and Mexico. It's not only the story of their survival but also the story of a family living in those tunnels and their survival. The story is written with incredible detail. Now it's not all about running but that is the basis for part of the story. Really, this is a horror story, and one you could see that could really happen -- well, maybe -- it feels true enough that it scares the crap out of you. Without spoiling the book, it will make you think next time you decide to run in a new city and in the dark. As I was reading it, I could relate to the story as I'm not one to be worried about my surroundings when out running no matter the time or day. The world is a big place and running is a great way to visit a new city. However, most people think I'm crazy to run in the dark in unknown places or in different countries alone. I guess I never worried about ---- until I read this book! Haha! There's quite a dark side to it but one that keeps your attention throughout the book. In fact, I ended up reading the book in one sitting while I was on vacation. Rarely do I read a book all at one time so it says something coming from me. If I'm not interested, it will take me weeks on end, even months to finish a book. I've read one of Mark's other books, The Jade Rabbit, which also was a good story but this book is one that I think every runner will enjoy reading, especially if they are looking for a bit of a scare with it. The book is available on Amazon, HERE, and should be out in print shortly. At $3.99 for the digital copy, it's certainly worth the read. You can also check out Mark's blog, Running, Writing, and Chasing the Dragon HERE which does talk quite a bit about running. * Note - I received a digital copy of this book for this review. All opinions on this blog post are my own and I was not paid or required to give a particular opinion on the product. As some of you may know, I did a review back in February 2012 and fell in love with the Tifosi brand sunglasses. I had never been a big fan of running with sunglasses, which was a bad thing. You need them to protect your eyes from the damaging UV rays. I was never able to find anything comfortable enough to run in until I found Tifosi. This is my third pair to review and I've been very happy with every pair that I've run in including these. You can read my other reviews HERE and HERE. Tifosi came out with some new technology for their lens called the Clarion Mirror lens. The lens are not only are mirrored, which is my favorite look, but they also have technology, which they call Hydrophobic, which repels water(including sweat) and helps prevent smudges. This is especially nice when running since it keeps your view clear. 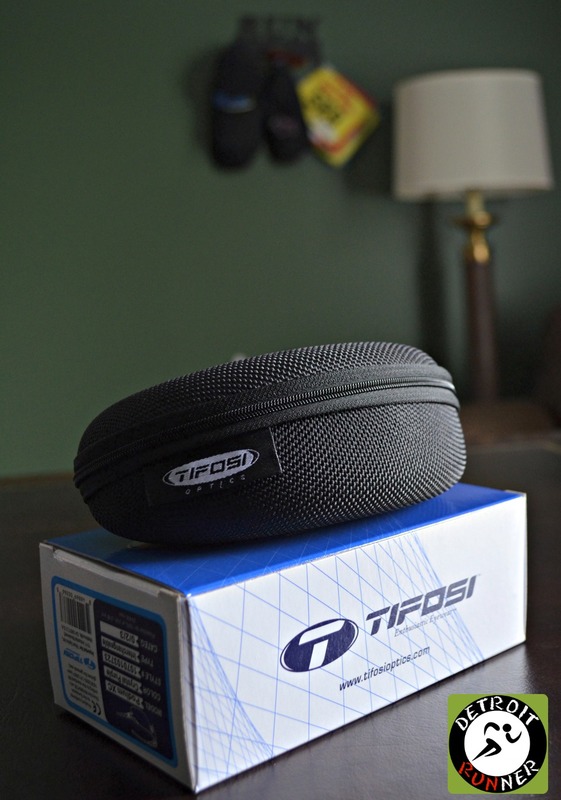 Every pair of Tifosi sunglasses comes with a very nice case as you can see below. No worries of your glasses breaking with this sturdy, well made case and it's perfect for when traveling. As you open up the case, not only does this hold the glasses safely but it also holds two other lens that come with the glasses including an amber(called AC Red) and clear lens. 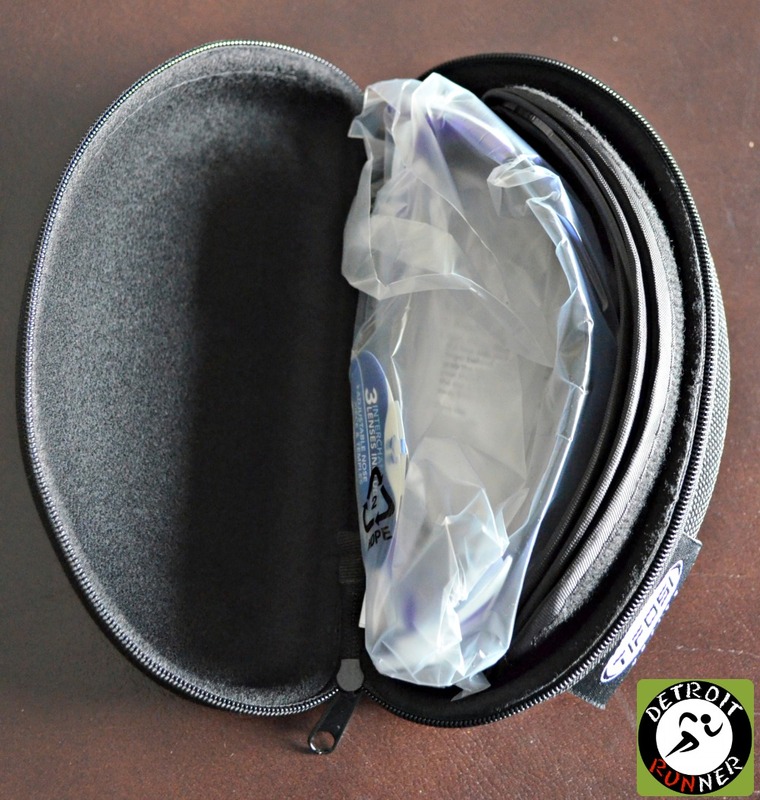 It also includes a microfiber carrying case that doubles as a wipe to keep your glasses clean. As you can see, the interior holds the lens separately so they don't get scratched in the case. Here's a close up view of the glasses. There are basically four parts to the glasses. The two removable arms, the lens and the nose bridge. The mirrors are really attractive and effective considering you can see me in the top picture taking a photo of them - hah! You also have the option to get an prescription adapter for those of you with that need. Crystal Purple color or blue and red options too. You can see these are a purple color called Crystal Purple. Also shown is the microfiber case that you can use to clean the lens. I love the color of these! The glasses come with three lens as can be seen below. The amber color aka AC Red, for all conditions, is good for near sunset or sunrise because it lets more light through. The clear are great for when the sun comes down and you don't need the darkening of sunglasses but still need eye protection. I especially like the clear lens for running while its raining or snowing but they are also helpful on the trails when biking/running and the sun is getting low. Because it only takes seconds to change, you can easily take the lens with you when you know the light will become less during your activity. The clear with the purple looks fantastic and is a very practical option. In order to change the lens, it's quite simple and take seconds to do. All you do is lift up the arm near the lens and the arm lifts off. The design is an ingenious one which comes off easily but also remains on tightly. I never had any issue with them coming apart on these or the previous sunglasses I've reviewed for Tifosi. Here you can see the arm off of the lens. The design is really an excellent one. Once you have the new lens on, the nose bridge pops off and goes onto the new lens very easy. Again, a very simple and great design. In regards to the fit, they are quite comfortable - and the style is one of the best they've come out with. 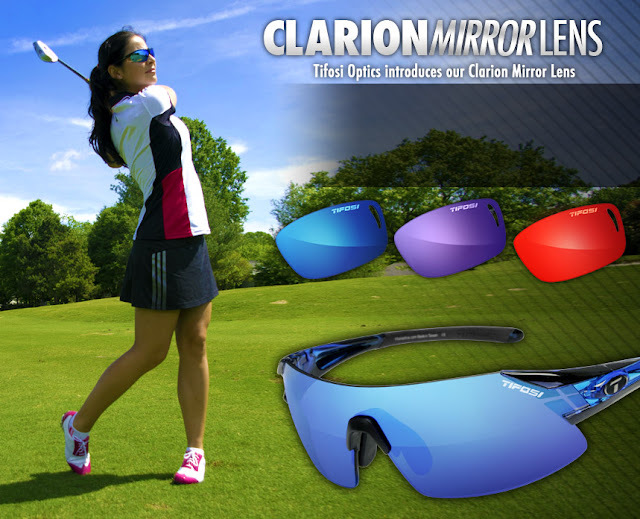 The new Clarion lens feature is a perfect fit for any activity but especially while running. The single most important thing to me while running with sunglasses is that they don't bounce around while running. As with previous Tifosi sunglasses I've reviewed, these pass with flying colors. In fact, only after three or four runs, I was so comfortable with the glasses that I ran with them for my last half marathon and they worked out great. I never noticed them one time during the race and that, my friends, is my definition of a successful pair of sunglasses for runners. For a retail price of $79.95, these are easily worth the money and comparable to sunglasses that are three times this cost. Available at various online and local retailers. 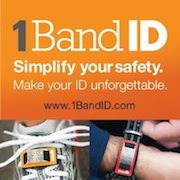 See their ad in the July Running Times magazine. * Note - I received a pair of Tifosi Podium XC sunglasses in exchange for this review. All opinions on this blog post are my own and I was not paid or required to give a particular opinion on the product. Renewal by Andersen of Detroit Relay Team! Didn't I just finish a race? Haha! Yes, I did but fortunately for me, I got an opportunity to run the Rockin' Relay in Detroit at Belle Isle courtesy of Renewal by Andersen of Detroit. Go "like" their Facebook page for chances to win great stuff! This makes for the busiest month for racing for me with 4 races in five weekends. I won a race entry and will race as part of their relay team with three other runners. Those three are Larry, who I've met through the Kona Running Company and, Megan and Alexis - also bloggers. So this is the deal. Run about 16 times around a 1.6 mile track, so basically, I only need to run a little over six miles to finish the marathon as a group. A far cry from my typical long run or even race for that matter but I'll be starting marathon training next Monday so I've decided to skip my long run for this race. Yes, it's true! I figure I could use the break anyway. 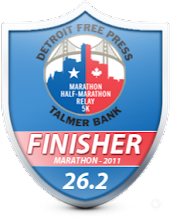 This will be my second marathon relay as I did the Detroit Marathon in 2010 as a relay as well which was a great time. 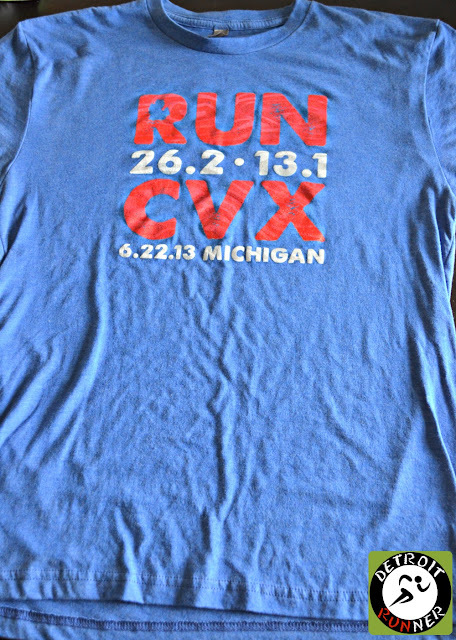 I've run with the Renewal by Andersen of Detroit team in the past, and I originally was thinking that I had not run for them this year but I forgot about the Freeze your Franny race in January. Poor Brandon really froze - at least us runners got to move around and get warm. 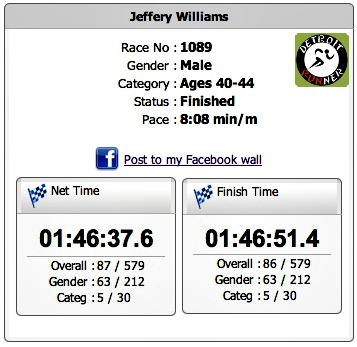 It had to be the coldest race I've ever run. It's fortunate for me that I get to run this race with three other great runners that I also happen to know. It should make for a really fun time. Freeze your Franny 5k - and we did! Full review of the race coming next week. Don't forget to "like" Andersen's Facebook Page(HERE) for your chance to win a future race entry too. Thanks to Renewal by Andersen of Detroit for sponsoring a spot for me to run on Saturday. I look forward to it. So you can never have enough running stuff, right? Well, I got a couple new things last week when on vacation. One I didn't even want to buy, believe it or not!!!!! We left for Northern Michigan and just as we were passing Flint, I realized I forgot my foam roller. For those of you that have ever had IT Band issues, you understand that a week without my foam roller would not be a good thing. I use this thing religiously and it keeps me running. So, the dilemma was to either turn around and waste 2 hours of driving(which I seriously considered) or buy a new one. Of course, foam rollers are not on every corner store but luckily I remember a running store was in Flint. I called them on the way and they had what I needed! Well, I didn't need it but I did. So I forked over the money for another stupid foam roller. 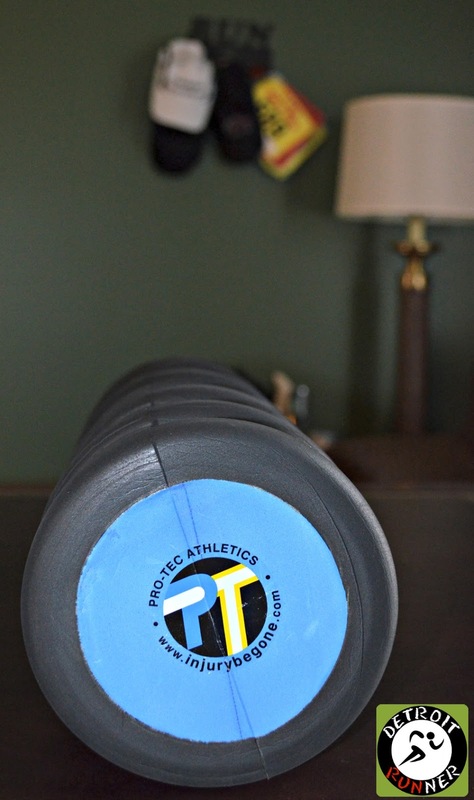 This one is the Pro-Tec Athletics version. Certainly, if I had the choice I would have bought a TP Therapy Grid, especially since the grid is less money. I like the Grid better, but this does the job and won't break down, so I sucked it up and got it. It worked quite well over the week I used it and will probably just leave it up north so I don't have to worry about forgetting it again. The next purchase I really did want. 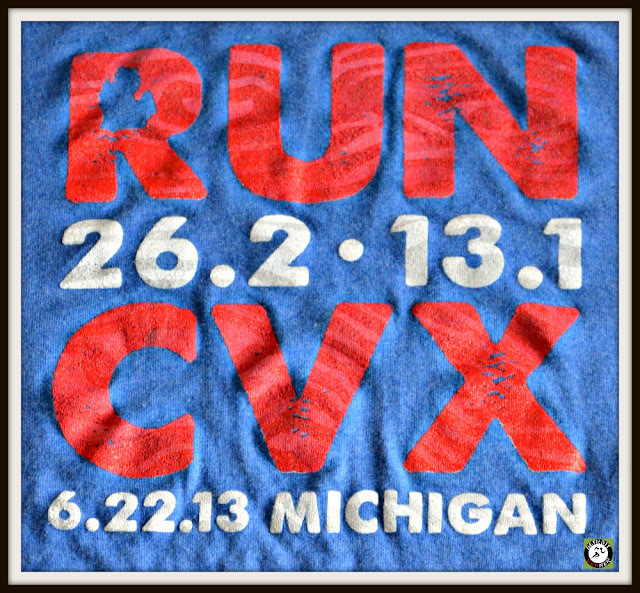 Last week when I was on vacation, we visited Traverse City and went to the Running Fit location there. I can't pass up going to a running store when it's right there, right? 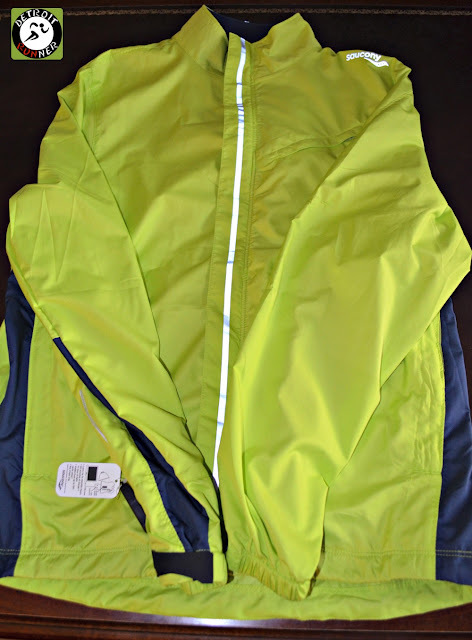 They had a 50% off rack and I found a nice running jacket that was water and wind resistant and nice and thin. My current jacket like this is starting to look really crappy looking so I got a nice deal on this new one. It's made by my favorite shoe manufacturer, Saucony! Can't miss me in the dark! Two more things to add to my running arsenal. I'll do reviews on both once I've had a chance to use them both more. Four miles is the hot and humid weather. The only good thing was that it was raining so it felt a little better because of it. Last week while on vacation, I decided to run around the golf course near my cottage. I had not really done this much but running it(of course, early so as not to disturb golfers) was a nice treat. For those of you that don't golf, the fairway has a cushion on it like no other surface and is excellent for running. I think I might actually try running the entire 18 holes in the future. Here's a few pictures from my run. I started off at my cottage. This is on the side of my home. I'm testing out my Tifosi Podium XC sunglasses with a full review coming soon. The course is a little over a mile away - well, actually it's across the street but where I can access it, is about a mile away so I started off on the streets to get there. It was a great day for a run! Soon I was upon the course and which my first view of the bridge over a pond. This is one of my favorite pictures while running and one of the best I've ever gotten running. As I made my way over to the bridge, I snapped a quick picture while running over the bridge. I love running over bridges and this was especially nice. I'm making my way onto part of the golf course at the end of the bridge. As I was on the bridge, I snapped a picture of the subdivision clubhouse. Of course, it was pretty quiet considering it was in the early morning. As I continued on my run, you can see how lush the golf course is. It's got a great feeling while running on it. Since I've golfed the course before, I knew there would not be any golfers out there yet since this is on the back half of the course. As I made my way through the course, I ended up back on the golf path that was paved. This is an especially nice area and has a couple small hills as well. I also got a picture of my favorite home in the subdivision. It's an awesome looking home and this is the back of the home looking onto the pond(pictured two above). With that, I made my way off the course and back onto the streets and home. It's about a four mile loop in total and a nice relaxing route to run. A new scenery is always a great way to refresh your love for running but having that soft surface makes it even nicer. What's some of your favorite running surfaces/routes? 3 miles today in my subdivision. Back to my boring route. Haha! Hot and humid already this morning! A well organized race with good communication. The Good Boy Events organization did a great job. The medal is one of the best for a half that I've received(better than most of my full marathons), a fantastic getaway half marathon in a resort town. Course had very little water views which was disappointing but still a very nice course. Registration was very simple. I registered online through their website and it was very easy. I received a confirmation e-mail and was all set. You could also check their website for registered runners to confirm you were registered. The race has an excellent website with all the information you needed to know. They also have a Facebook and Twitter page for additional information. I did e-mail the race director in regards to possibly picking up my buddy, Kevin's packet, since I thought I might be there early on Thursday, and he e-mailed me back right away that I could pick it up if necessary. They changed the schedule the week of so there was no packet pickup Thursday but it was communicated well before so it was not an issue. 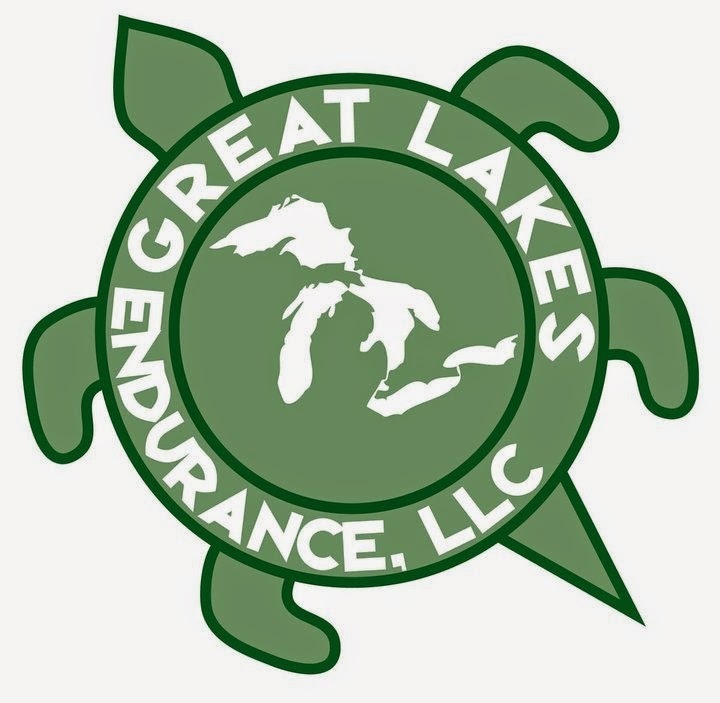 We decided to go to packet pickup the day before the race so that we could tour around Charlevoix for the day as well as get our packet early. 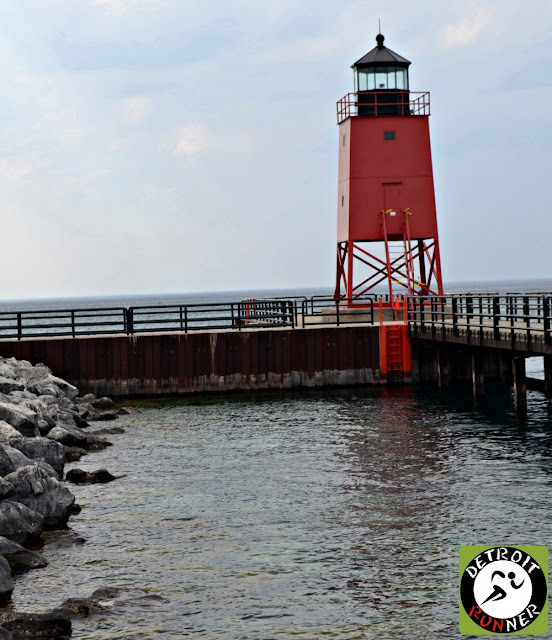 For those of you that have not been to Charlevoix, it's definitely a place that you would want to visit regardless if there was a marathon going on or not. My cottage is about an hour away from Charlevoix so we stayed at my cottage rather than a hotel. 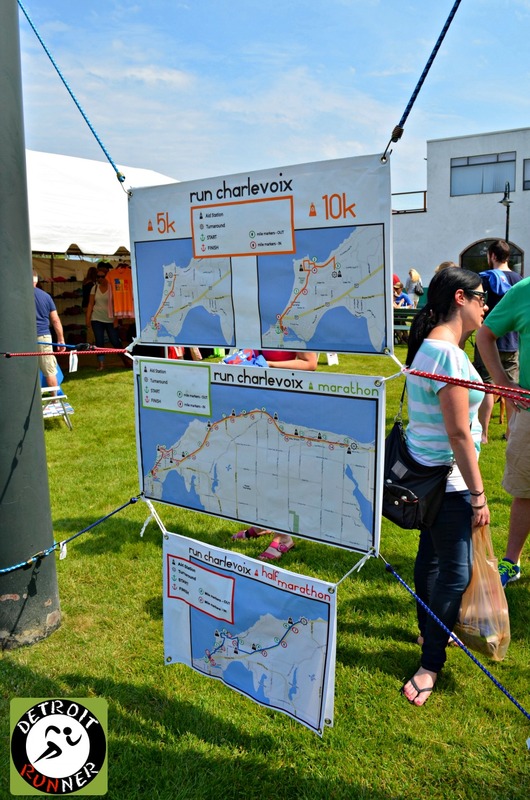 There is plenty of places to stay if you chose to stay in Charlevoix, which an awesome town to visit, so this is a great race vacation. We got to shop around downtown and also walk by the lighthouse area which is right downtown. The city also has a drawbridge that opens every half hour so you can see it working. Below was a picture I got of it when standing near the beach. I just happen to get a runner in it. They also have boats going over to Beaver Island from Charlevoix as well and while I've not been there, I've heard it's a fun day trip. The marina is also right downtown as well. The downtown area is beautiful with a main street and the marina in front of the main road. The area also has concerts downtown in this area as well. As we came to packet pickup, the race had a store set up of merchandise to buy for the runners. They had an excellent selection of shirts to pick from as well as many other things to purchase for race prep. I ended up purchasing this shirt which I thought was very nice and is super comfortable. I love the Michigan map on the shirt along with the race information. In addition, with any purchase, you also received a free pair of socks with the marathon information on it - bonus!! They are tech socks too so you can run in them. Overall, I spent $15 on the shirt and received a free pair of socks so I think that was a pretty good deal. Next to the store, they had late registration and also packet pickup set up. With all races I have been to, the race usually has a board with your number and then you give the volunteer your number. In this case, they had everything by alphabetical order so all you had to do was give them your last name and you were all set. The volunteer gave you your shirt, bib, safety pins and your tech hat as well. Packet pickup was very easy and we were in and out in a matter of minutes. The volunteer warned us that parking might be an issue the next day and to arrive early - a helpful tip. You also had the ability to pickup your packet the morning before the race which would have been no issues at all considering this was not a huge race. I'm happy to see the organizers give you a choice in case you are not staying in town and was to get your packet that morning. The race also had the maps set up for each race distance(as well as on their website). You could run the full marathon, half marathon, 10k or 5k and everyone received a medal no matter what distance you decided to run. After packet pickup, we toured around town for a couple hours, saw the lighthouse and beach area, and made our way to dinner in town. We originally planned to go to a restaurant on the water but it was a 45 minute wait so we ended up at an italian restaurant right downtown. There were a ton of runners out and about. After dinner, I got a quick picture before we left of the water and we headed back to the cottage. Since we were an hour away, we left about 5:30am from my cottage. The race started at various times because the race allowed walkers to start earlier than the runners. Full marathon walkers could start at 6am vs. 7am for the runners. The half marathon runners started at 7:30am so leaving at 5:30am was perfect. We came right downtown and had no problems finding parking. If we had gone a half hour later, it probably would have been more difficult to find a spot since there were about 1,700 runners between all the races and the town is just not set up to handle that amount of cars at one time. Parking was free on Saturday morning which was nice. The picture below was taken right next to where we parked. What a difference a day makes, huh? It was overcast and foggy, which frankly was great for running. It sprinkled a little on the way to the race but did not rain during the race at all. In fact, it ended up being a gorgeous day. While it was overcast, there was also 100% humidity at race start - yes, it was humid, but overall still very nice for running in June. 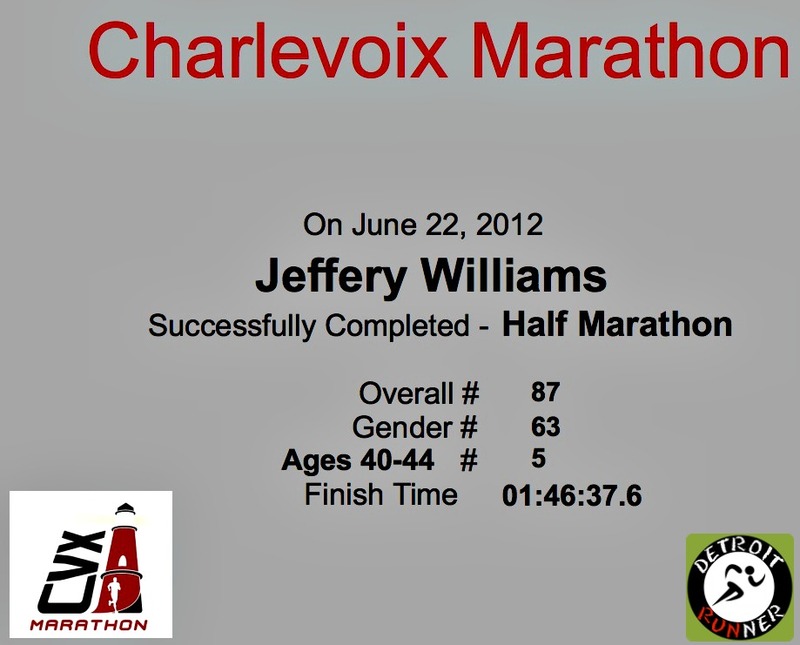 In addition, it was only 59 degrees at the start time which is great for a late June marathon. Boy what a difference a day makes! One secret that you should know if you decide to run this race is that there are public restrooms near the marina. Take advantage of this! We used the bathroom before we headed to the start area and there was nobody there(probably because people did not know about this). When we got to where the port-o-potties were, there was a big line for the bathrooms. The race also mentioned that we could take showers at several places after the race, including the marina for $5. This is awesome considering you might need that time if you have to check out of your hotel before the start of the race(especially great for the marathoners). There were also a couple free options for showers as well. We were originally planning on doing the race and showering after with our family to meet us at the finish but decided it would be better to just have the family come the day before for packet pickup. While I mentioned there was a large line, there were plenty of port-o-potties for the amount of runners. They had them set up very close to the start line. I grabbed a quick picture of the channel taken from the drawbridge and, as you can see, it's quite foggy out. You'll see our picture of it after the race. Since there were only about 600 half marathon runners, the start line was very easy and not congested at all. We set ourselves up about a third of the way back from the start which seemed to work great and I only had to run around a few runners at the start. The race was using one lane of traffic and the police were doing a good job directing things. They had cones along the way to keep it safe for runners. The start area was well organized and in a good spot. While it would have been awesome to run right through downtown, given the drawbridge next to downtown, there was no way possible to set up the start and finish line through the downtown area. You can see from the Garmin map that things begin in downtown Charlevoix and then you make your way out through the neighborhoods, eventually seeing the water near the turn around. The course was an out and back course. While I know some people do not like the out and back course, I enjoy it and while you are running the course back again, it always seems like you are on a different course on the way back. You just get a different perspective. As you can see below, the course is not completely flat, however, I didn't feel it was a really difficult challenge either. There were a couple areas that were tougher but nothing crazy. Don't be afraid of the elevation because it looks worse that it really is. 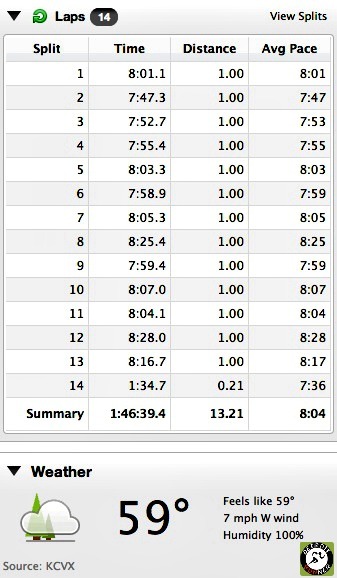 I tried to keep a fairly even split throughout the course but it always seems like mile 12 is my downfall. Haha! Oh, well! I really enjoyed the course overall. I was a bit disappointed that we did not get to see more of the water during the race but, as you look at the map, I guess I should have expected less water. When I got to the turn around where the water was, I actually had wished I ran the full marathon. I bet the views for the full marathon would have been much better considering they head out much further than us half marathoners. There's not many courses where I wish to run the full but, I believe, in this case, it would have been the better choice if you wanted more of those views. Note: When I take pictures during the race, I don't change my pace for stop in the interest of safety. I just keep running and I get what I can get from the pictures. Some come out better than others but they give you a great idea of what the course is like. Please also keep in mind that for this particular race, because of the fog and overcast skies, it was especially difficult to get some good pictures while running. Unfortunately, I took almost 200 pictures on the course and this is the best that I had today. The start, of course, was right in downtown Charlevoix, but we quickly headed into a neighborhood near downtown and the water. For the first three plus mile stretch of running, it was through neighborhoods which had some stunning homes and cottages. Some of the properties were on the water, but mostly, it was difficult to see the water. Before I knew it, I was already at mile one and the crowd was starting to thin a little. You can see some of the runners had stripped off a layer of clothing since it was already hot to start. Shorts and short sleeves were perfectly fine even though it was a little cool to start. We passed some incredible homes but here's a cute cottage that I got a picture of. As you can see below, some of the homes in the area are incredible so it was nice to run by these to take your mind off things as you ran. There were a couple turn arounds for the 5k and 10k since every race was an out and back style course, including the full marathon. Below, the police had the street here blocked for us as we headed onto a paved running/bike path. If you take this path far enough, you could run all the way to Petoskey on it. The path ran past the Charlevoix Country Club which had a very nice manicured area. The path was nice to run on and it was not crowded at all for the runners. It was quite wide and plenty of room for both runners coming and going. The path goes along US31. 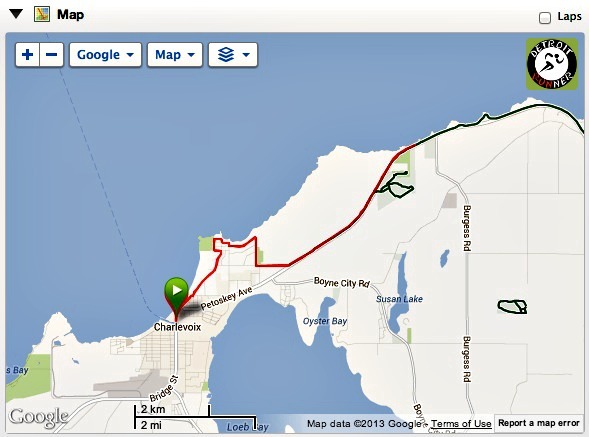 Even if you don't run, this road is an excellent drive with some fantastic views along the way heading into Petoskey. As we got further down the road, there was a boardwalk that we ran on. This was one of my favorite parts of the entire course. I love running on this and it made me feel like part of where I train on a daily basis. The boardwalk was incredibly long and felt like a half mile(but probably was not that long). The course had a couple spots with port-o-potties for the runners. In regards to course support, there was not much out there. They had a couple of pockets of places where there were people cheering runners but, for the most part, much of the course was fairly quiet. For the half marathoners, our prize came almost at the turn around when we were finally able to get a clear view of the water. This is what I had been waiting for and it would have been awesome to see more water on the course. This is why I mentioned the full marathon might have been a better choice, at least for the views. The race had an aid station at the turn around for us as well. Of course, if you were running the marathon, you would have kept going. The marathoners started at 7am so we did not see any full marathon runners the entire time running. We did see some half and full marathon walkers on the course. The other great thing about an out and back is you get to see the top runners out there pass you. One thing that I would have liked to see was a timing mat out at the half way point so you could have a split time on the course. There was a four piece band set up to give runners some entertainment, which was nice. Due to the location out on the path, I'm sure it's why there was not more entertainment since there was no spots for electricity. The band, frankly, was a nice surprise. As we headed towards downtown, you can see that Charlevoix lines their streets with flowers which is unique to any downtown area I've been in. It makes the downtown area look very beautiful and inviting and it was great scenery coming back to the finish. As you can see from the next few shots, there were more spectators along the path now as we got closer to the finish line. Spectators were at the finish line to get pictures and cheer on their runner. We passed a timing mat about 50 yards from the finish and the announcer was calling out runners names as we finished. I didn't hear mine but I always love when the race does this. As you can see below, right at the finish line, is also some condos/hotel where you could stay should you decide to do the race. The start was literally right outside your room. Of course, keep this also in mind that if you have family that want's to sleep in, then that place is probably not the best choice since the announcer started fairly early. 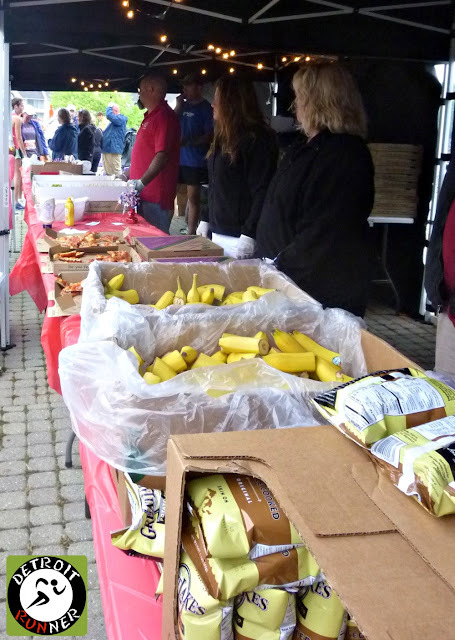 The aid stations were plentiful and were well manned by volunteers. The volunteers were all friendly and yelling water/gatorade as you ran past. The race also had a GU station as well as some other goodies to keep you going in the race. Below was the first aid station where the 5k turn around was located on the course. The town firefighters were also out there volunteering close to where the 10k turn around was. The finish area was right near where the start was located just next to downtown. After you finished, you made your way over the drawbridge to where all the food was located. It was in the same location of where packet pickup was the day before. You can see below, after the fog had burned off, where the lighthouse is. It's one of my favorite finish line photos with that background. The finish line area used the same tents as where packet pickup is which was a great idea on the part of the organizers. This little park area is right in downtown and right next to the water. It provided plenty of room for the runners to socialize. 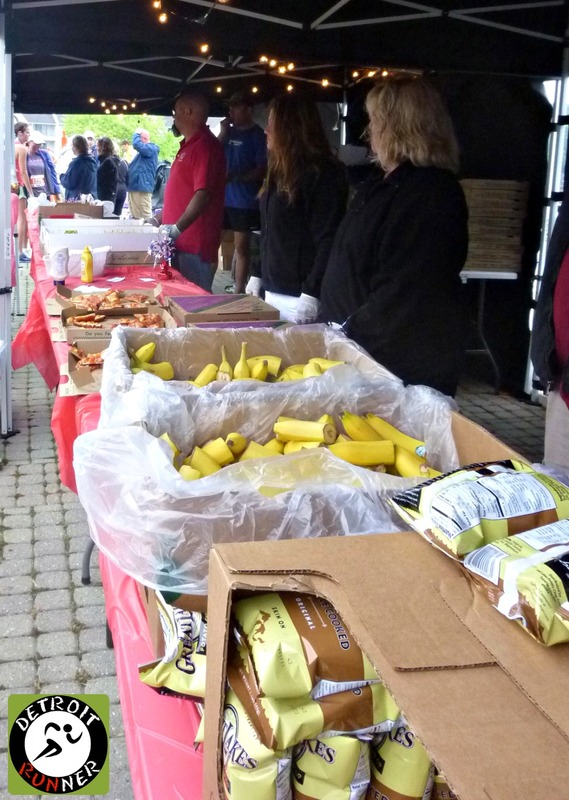 The race had plenty of finish line food including local potato chips, sub sandwiches, pizza, and bananas. They also had licorice as well. The area was well organized with plenty of volunteers to help you if needed. The timing company had two monitors set up for results from the race. The results were not in yet when we got there but it's a nice way to get your results quickly. 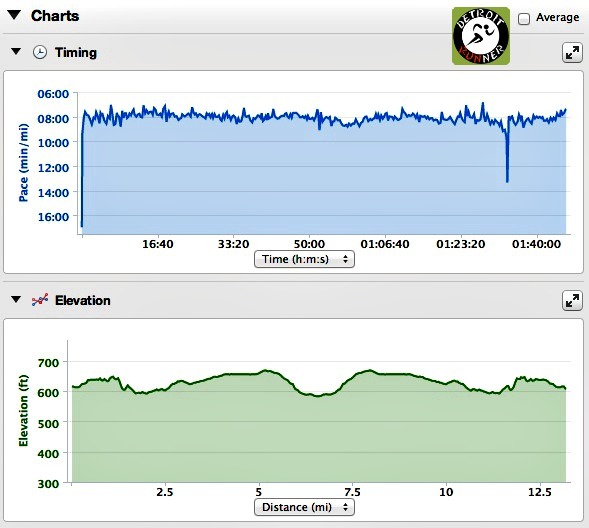 In addition, the timing company had results on their website and you could track your runner and find results immediately after the race. They did not have the QR codes on bibs which I think is a great and easy feature but nevertheless, we had results right away. For your race entry, you received a fully supported course with aid stations, police control and a timed race. In addition, you received a race shirt which is a polyester/cotton blend. 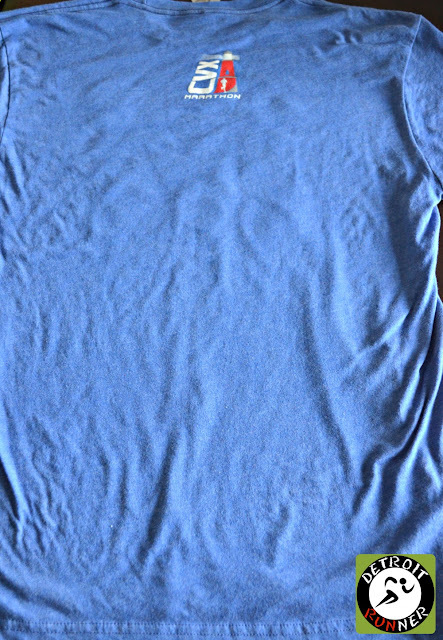 It's actually a very comfortable shirt, and as I've said in the past, while it's nice to get a tech shirt to run in, I love getting shirts like this for daily use when I'm not running. It's a well made shirt. The other incredible thing about this shirt? NO sponsors on the shirt - a huge bonus! Sometimes I feel like a walking billboard with some of the race shirts I own. While I can understand the need to have sponsors on the shirt, kudos goes out to the organizers(and sponsors) for giving us a sponsor free shirt! It's a rare thing to have these days. 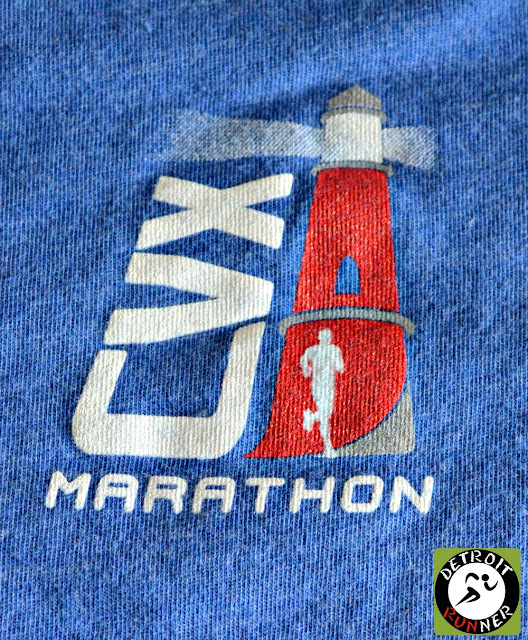 In addition to the shirt, you also received some free temporary tattoos which was fun(and I wore mine during the race on my calf), a custom Charlevoix Marathon tech hat that can be used while running and an awesome medal. The medal has some incredible details in it, it's a large medal(larger than 3 of my four marathon medals) and one of the nicest half marathon medals that I've received. It should be especially noted that again, there are NO sponsors on the race medal too, which is incredible! I felt the race organization was excellent. The race had an awesome website with tons of information and answers to all your questions. They had regular e-mails with information for the runners including any changes they made(which were minimal). They had a pre-race meeting you could attend for any other information. The race director was excellent at getting back to me right away which is alway a bonus given how busy many of them typically are race week. Good Boy Events was the race organizers and this was the first event that I've run that they put together and I would not hesitate to run another one of their events. Overall, this was a great time. It's a perfect race vacation in an incredible resort town. It's the perfect long weekend getaway that offers plenty to do for the entire family and not just for the runners. Everything is well located within walking distance so, once you park, you don't need to drive again. The race was well organized, not crowded, and while I would have liked to see more of the water on the course, it was an enjoyable course that I could see doing again. The race company did an excellent job and offered some great amenities for the cost of the race(I paid $65 only two months out of race day). 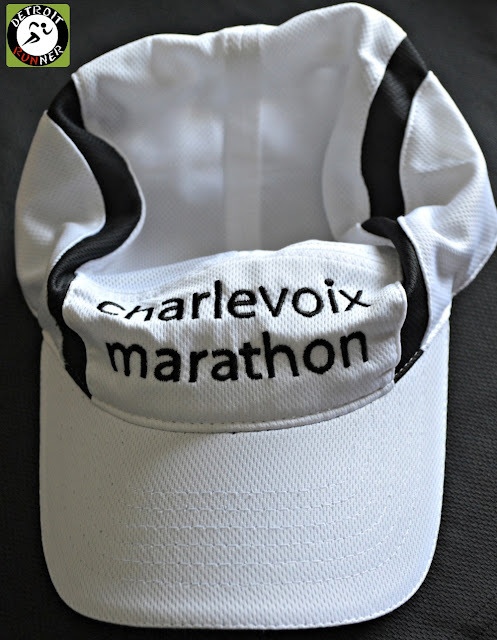 I loved that they offered a great shirt, race hat and medal - things that are important to me when deciding where to race. I'm sure I'll be back for a race organized by the Good Boy Events sometime in the future. 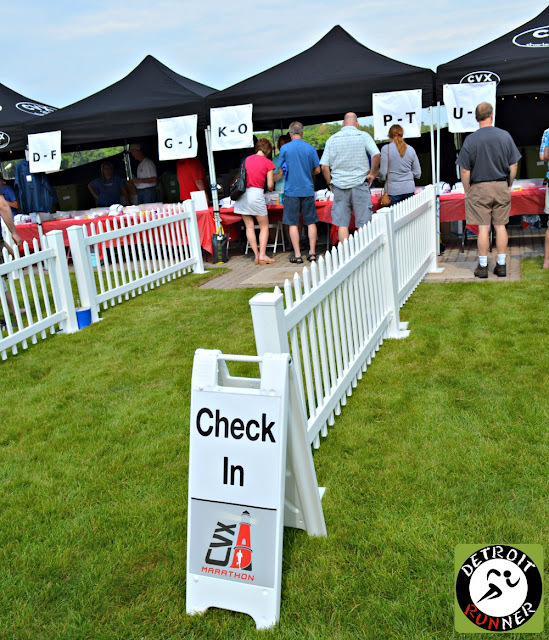 If you are looking for a nice summer event in Northern Michigan, you won't be disappointed with running this event. Cheribundi Juice Review and Giveaway!! Saucony Ride 6's out today!!! !